Rapid growth through strong bone and muscle development. Suitable for all species of game birds. Complete Feed – easy to use crumble feed form. ...One product contains all the nutrients your birds require. o Specifically formulated for young birds ...Designed to promote rapid growth through strong bone and muscle development. o Flexibility... ...Game Bird Startena® Product is suitable for all species of game birds. o Insurance... ...The crumble size is small enough to help prevent starve-outs. o Better performance... ...High protein means that your birds get the extra nutrition they need for proper growth. oReducedrisk... ...Proper protein and salt levels provide maximum protection against cannibalism caused by imbalances of these nutrients. o Provides uniform nutrition... ...You know your birds are getting a complete, balanced ration with every bite. 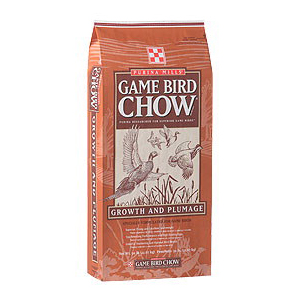 A complete ration designed to promote maximum early development for game birds. Plenty of clean, fresh water should be available to the birds at all times..
Feed free choice to birds as a sole ration until 6 weeks of age. Start with a small amount on paper or cardboard to make sure that all birds begin eating.